How to use shri yantra, know more about the shri yantra , how to worship and how to get more and more money with help of shri yantra. There is a difference between to earn money and the money keeps at home. Mars, Jupiter and Venus give benefits in the home. Blessings means money does not remain stop and it spends in good work. Shri Yantra helps to give good health and patience. Blessings do not mean only money. If the Mars, Jupiter and Venus are weak of head of the family then blessings do not get easily. Such homes in which the atmosphere, Vastu is bad they also do not get blessings. Also the head of family is affected by “Pitrudosh” then also he does not get blessings. Do not think more so that you can avoid your problems. Where there is quarrel blessing do not get. If Rahu and Saturn are also weak then blessings do not get easily. Such homes where there is more logic used, that homes have money but there is no love and patience. Such homes where there is no storage of food materials there is no blessings. Blessings also do not get in such homes where the head of the family is unemployed. Blessings do not get in those homes where animals also do not remain alive. Such place where it is not keep clean, might be dark, small place, they also do not get blessings. Such homes where there is a water in middle of the home they also do not get blessings easily. If the guests also do not come to the home in such home they do not get blessings. If the Venus mountain is upward, Rahu’ place is normal then you can get wealth. Light twice, during sunrise and sunset, in a day. Home should be good and there must be fun at home. You should take lunch/dinner at proper time, also do exercise. Donate something from home. There must be fragrance in home. Sometimes you can also do “Katha”, “Yagna” and “Satsang”. Invite the “Guru” or Idol at your home. Stay happy in home. Avoid quarrel in home. You can also plant “Tulsi” at your home. Do not make ceiling too high or too low in your home. The height of the ceiling would be at least 10.50 - 13.50 feet. You can also drop some Sun water in home. Be loyal on your work and take money of loyal work. Shri Yantra normally considered as good for money however it is not right. By worshiping Shri Yantra it gives wealth and good luck. A person who worships Shri Yantra perfectly he will definitely get the happiness. 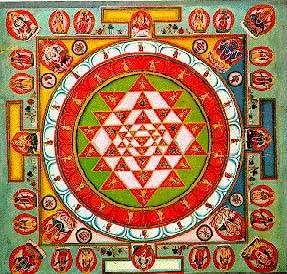 Shri Yantra is the structure of “Shri Mahatipuraksundari” Devi. Shri Yantra has 9 nature and which shows in 9 triangles. By worshiping Shri Yantra it gives 9 powers and 9 wealth. Happiness is the 1 triangle which is red and “Shri” has been written in that. If you concentrate on Marriage, happiness and money point then you will get happiness. It gives the wealth to family and “Shiva Shakti” to devotee. The 2nd triangle gives all wealth. If you see it carefully you will find names of 10 “Mahavidhya” “Asthasidhiya” and “Nav Nidhiya”. By worshiping, you will get all the wealth. The 3rd triangle is “Sarvagruha” means the disease of the body. The 4th triangle protects from all bad luck and 5th triangle helps to complete the work. The 6th triangle gives wealth. You need to worship the Shri Yantra properly. The 7th triangle is “Sarvasanksomkarak”. The 8th triangle completes all 8 sides. The 9th triangle is also called as “Trilokya Mohan”. You can get complete life by worshiping Shri Yantra. It is the source of human cycle. It shows the combination of Shiva and Shakti. The “Adhomukhi triangle” is power of Shri Yantra. The upward triangle is for Shiva. “Kundalini Jagran” gives energy of mind and body and it creates new nature. There are 16 “Kamal dal” whose relations are different. There are 8 “Kamal dal” inside the triangle. Mind, ego, touch, look, smell, picture, patience, Smriti, name all are part of Shri Yantra. It gives the strength of all ten sides. You can also read “Saundarya Lahari”, “Durgasaptsati”, “Kaulachar” and “Rudrayamat”. Shri Yantra made from Saftik, Silver, Copper, Gold or from eight metals. You have to meditate to worship of Shri Yantra. It must be worship in those homes where there is no quarrel, bad things occurs. You should keep Shri Yantra from certain Guru. You can do it your own but only then when you get all the knowledge about it. No one can worship without learn it. You should keep Shri Yantra as a god after worship it. Always keep Shri Yantra in yellow cloth. If you are going on a “Yatra” and want to keep Shri Yantra with you then you should take it in Wooden Box. Shri Yantra should be worship on special days such as “Sukala Paksh on Wednesday, full moon day, Holi and Diwali. To worship first clean you, sit on Ashan. Bow in front of your Idol. You should worship your Goddess and Shiva. See on middle of the Yantra and bow and do meditation. Do worship of “Shri Shukt”on Wednesday, Friday and full moon day. There is an importance of metal in Shri Yantra. For marriage life Saftik Yantra is very good. Shri Yantra which is made from silver gives good wealth. Gold Shri Yantra gives strength to fight against terror, mind problems, enemies. The worship is worthless without “Maa Tripur Sundari”, “Aadi Sakti” and “Shiva”. The original power of Shri Yantra is the combination of Shiva Shakti. You should also do worship of “Om Shir Namah” by Tulsi or Rakht Chandan at least 108 times.